About Hotel: 3-Stories, 82-Rooms, Interior Corridor, Free local calls, Free Wi-Fi, Television, Air-conditioned, desks, Guestrooms are all non-smoking, Pets Allowed, Indoor Pool. Railroad View: Excellent View. All rooms in this motel will have a railroad view. Try for 2nd or 3rd floor room to stay above the parking lot. West side rooms will have a better view due to the angle of the railroad. There are no trees along the railroad is this area. Railroads past Hotel: Norfolk Southern / Amtrak. About 60 trains a day operate over this busy rail line. Most are freight. The Amtrak's pass Huron over night. A railroad grade crossing near the hotel will give you notice of an approaching train, and may keep light sleepers from falling into that deep sleep, though one visitor told us the horns aren't too loud - and that was from a non-railfan! Notes: Built as a Microtel Inn & Suites, it later became Home Town Inn before becoming a Motel 6. Its 6 miles away from the Cedar Point amusement park. Photo Comments: Above Left: I didn't know this was coming, otherwise I wouldn't be in the motel! The RBBX circus train zooms past the Motel 6 heading westbound. During late afternoon sun hits the rear of the motel making photography difficult. Above Right: The next morning, I photographed one of several double stack trains that passed the motel. These photo's were taken from room # 325. Right: Norfolk Southern C40-9W # 9270 sounding its horn for the Rye Beach Road grade crossing. This photo was taken with a zoom lens. Trains pass at a quick pace, around 50 mph. Due to the distance, the horns are not too loud, but can be heard from the rooms. The windows do open, if you really want to hear them! About Hotel: 1-Floor, 25-Rooms, Exterior Corridors, 24-Hour Front Desk, Complimentary Coffee, Cable TV, No internet access available, 3 day notice of cancellation to avoid charges on your credit card, All Rooms are non-smoking, Roll-away beds are not available, Cribs are not available, Pets are not allowed, Cards accepted at this motel are Visa, Mastercard, and Discover. All rooms are simply furnished with air conditioning. Many Rooms also include a refrigerator and microwave oven. Single Queen and Double Bed rooms are available. Railroad View: Excellent View! Any room on the front of the motel will offer an excellent railroad view, trains are just across the road. Railroads past Hotel: Norfolk Southern / Amtrak. This is the Chicago Line, Norfolk Southerns busiest route. Expect 60+ trains during a 24-hour period. The 4 daily Amtrak trains scheduled all pass during the night, unless they are later. Notes: This motel is great for both railfans and maritime buffs, its located right on the water! 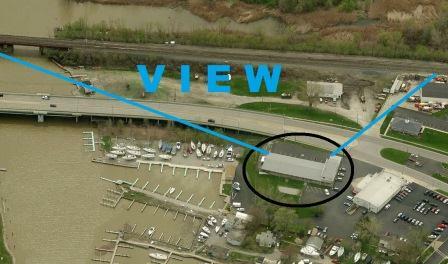 Photo Comment: The aerial view shows the Gull Motel circled in blac,, the railroad view is shown in blue. The double track railroad can be seen across US-6. 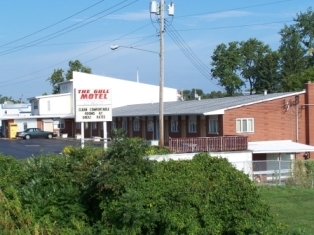 Internet reviews for this motel are good, most people only complain about the noise from the railroad, in our hobby this is only a plus!